In these austere times, some people, looking for cheap art materials, are turning to ice. This weekend Studio Bricolage is holding a family ice sculpting party in Griggs Park in St Paul. There are no dangerous tools involved - but deep belief in the value of fun. If only mad dogs and Englishmen go out in the midday sun, then maybe only artists and crazed journalists go out in a biting Minnesota wind on a sub-zero day to play with ice chunks. 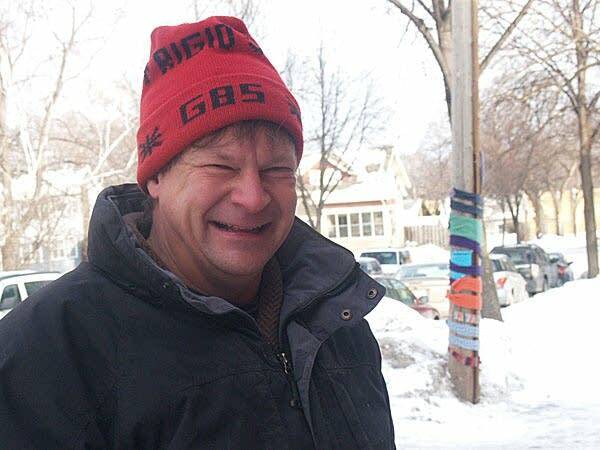 "It's a little nippy out here," says my host, Willis Bowman, or "Bow" to most people. Outside Leonardo's Basement, the south Minneapolis workshop Studio Bricolage uses as its home base, Bow leads the tour. 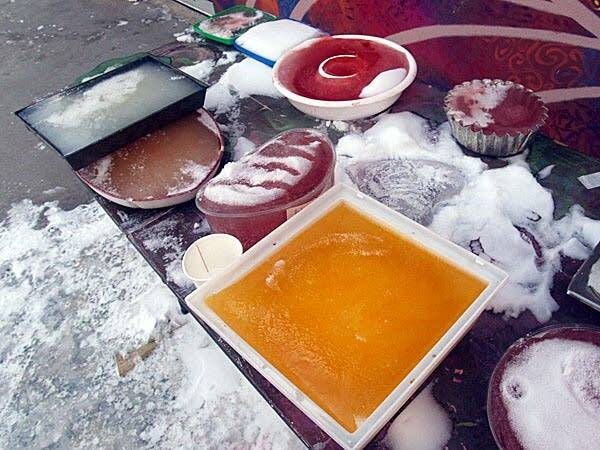 It's not long, consisting of a table covered with trays of brightly colored ice in a variety of molds. "Right we've got an oil pan. This is a kind of a steam serving tray," he says. Bow's a big bear of a guy, who loves what he does. His list of shapes go on and on. This isn't traditional ice sculpture, the stuff with the chainsaws and the chisels. These shapes are destined to be fused together with spritzes of water from a spray bottle, and some help from old man winter. The way Bow tells it, this all evolved from something he saw at a neighbors house a few years back. 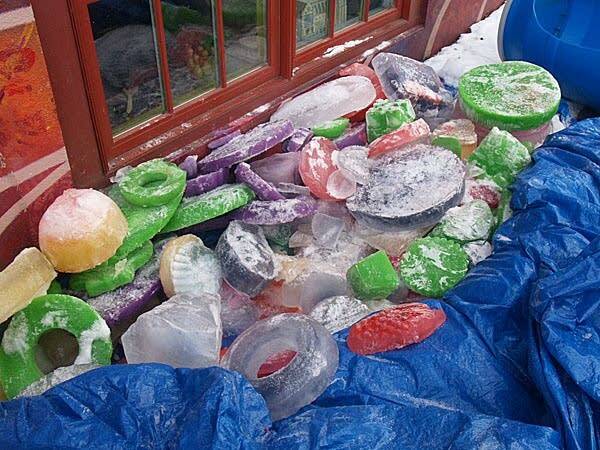 "Her front yard was littered with these very very colorful ice sculptures, and it was teasing me, every time I went by, 'What is this?' And who is doing this?'" he said. So he knocked on the door, and asked. Soon he was not only getting a tour, he was learning how to do it. Bowman describes ice as ephemeral. It's there until it's not, although at this time of year it seems to be around a lot. "You know we are surrounded by it for six seven months of the year, so we might as well take advantage of it" he laughs. This weekend will be the third annual Studio Bricolage ice-sculpting party. Bowman says people tend to make towers with the ice, although pictures from other events show ice lanterns and shapes hanging from trees. Bowman hopes people will freeze their own ice-shapes and bring them along. In years past people have even used balloons and rubber gloves to make really exotic shapes which are spritzed and added to the pieces. But he's also been making some extra pieces. He pulled a tarp, revealing a treasure trove of ice jewels: blues, greens, and purples. "Kool-Aid and Tang," he says. "Kool-Aid isn't too great, because the color isn't all that strong. But Tang is absolutely wonderful. And you know what's the great part of it? You can lick it afterwards!" he cackles. Bow Bowman doesn't stop at color though. He's embedded things in some ice blocks: plastic jewelry, golf balls, even lanyards so people can wear the ice around their necks. He says there will be ice painting too, and he hopes to create a maze on the rink at Griggs park to add some fun for the skaters. Finally, we see sense and head inside, carrying a huge fluorescent orange ice chunk still in its mold. Having popped the 25 pound Tang block out of it's mold, Bowman sits down to explain There is reason behind the wackiness. Some of it is the economic downturn. "People have less means to 'get your jollies' more or less, to go out and try things," Bow says. Since the economic downturn, do-it-yourself has exploded as a hobby, whether is be home repair or in the case of many people more arts and crafts based activities. Bowman says the whole idea behind Studio Bricolage is to get adults to play, to do something creative for no purpose than to have fun. "I don't think adults play enough, at all" Bowman said. "So we are happy to give them a place to let people play." Studio Bricolage's classes, including its annual Rube Goldberg event this Friday evening are very popular. The ice-sculpting is open to all ages, from 1 till 4 pm on Sunday at Griggs Park in St. Paul. 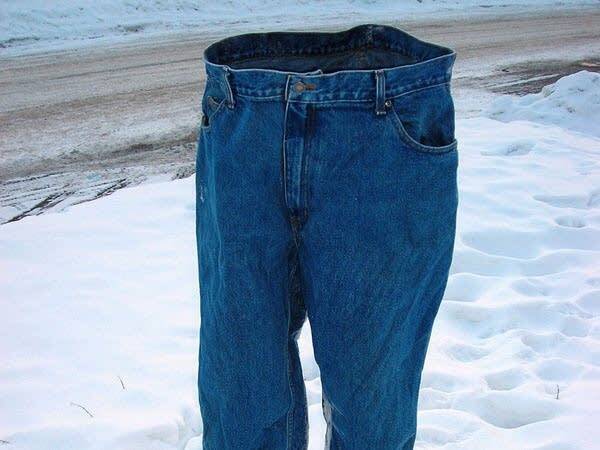 Special guest sculptor Peter Hoh, who creates figures using frozen clothing will also be there. And of course all those tasty blocks of Tang. "Mmmm, it's good," Bowman says with a big grin.